WASHINGTON, D.C. -- At a time when partisan differences abound in American public opinion, Gallup finds the images of U.S. businesses and industries are not immune: There is a significant difference in how Republicans and Democrats rate nine of 25 business and industry sectors in the United States. 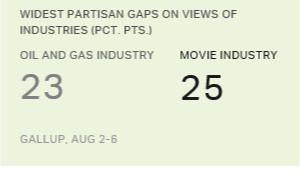 The movie and oil and gas industries generate the most polarized reviews, with Democrats much more positive about the movie industry and Republicans much more positive about oil and gas. More generally, Democrats (including Democratic-leaning independents) are more likely than Republicans (including Republican-leaning independents) to have very or somewhat positive views of six industries, while Republicans hold more positive impressions than Democrats of three industries. Gallup has measured public attitudes about U.S. business and industry sectors as part of its Work and Education poll each August since 2001, asking respondents whether their overall view of each industry is very positive, somewhat positive, neutral, somewhat negative or very negative. This year's survey was conducted Aug. 2-6. The movie industry has a partisan gap in positive ratings of 25 percentage points: 60% of Democrats view it positively vs. 35% of Republicans. It also stands out as one of a handful of sectors that have seen their image become more polarized over the course of the Gallup trend. Additionally, there is greater Democratic positivity toward the publishing, computer, television and radio, and advertising and public relations industries, as well as the field of education. 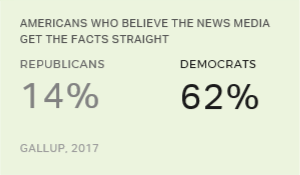 Democrats' more positive views of information industries like publishing and television make sense in the current political environment, with a Republican president who is at war with the media -- however, these patterns are not new. Democrats have tended to view these industries more positively in previous years. Still, it is possible that the movie industry has been swept up into the partisan landscape, given many high-profile actors' association with the Democratic Party and its causes. And the partisan gap on education may tie in with a recent Gallup finding that many Republicans believe higher education is too liberal. In addition to the oil and gas industry, which 50% of Republicans and 27% of Democrats view positively, Republicans hold more positive views than Democrats of electric and gas utilities and the retail industry. At least half of Republicans view all three sectors positively, compared with less than half of Democrats. Republicans' higher ratings of the two energy-related industries may reflect the close connection between these industries and public policy, including oil exploration and environmental protection. Republicans tend to side with oil and gas industry interests on these issues, while Democrats tend to side with environmental interests. This year's 23-point difference in Republicans' and Democrats' positive views of the oil and gas industry is larger than normal, but is overall reflective of Republicans' consistently more positive view of the industry. No other business or industry sector in the poll this year is associated with a statistically significant gap in Republican and Democratic ratings. This includes the accounting, airline, automobile, banking, farming, grocery, healthcare, internet, legal, pharmaceutical, real estate, restaurant, sports, telephone and travel industries, as well as the federal government. Americans' impressions of the country's major business and industry sectors are the most positive, on average, that Gallup has found in 17 years of measurement. A majority of Americans view nine sectors positively, the most in any year since 2003. However, these ratings are not uniform -- rather, Republicans and Democrats have significantly different attitudes toward about a third of these industries. The party gaps in favorability toward the movie, publishing, TV and radio, and energy-related sectors are most notable because they result from fundamentally different reactions from the two parties. Majorities of one party, compared with far less than half of the other, have a positive impression of each. By contrast, while sizable partisan gaps are also seen toward the computer industry and education, majorities of both party groups view these sectors favorably. Still, Americans evaluate most of the industries measured without a partisan lens, giving these sectors the opportunity to build or, in some cases, repair their brands without having to battle fixed political mindsets.